In the previous post Marcus Allbäck and his Stockport team managed the great feat of back-to-back promotions – meaning a return to League Two and professional status! This post will review the first half of the season, can Stockport continue their impressive form? Many players had noticed that the light in manager Marcus Allbäck’s eyes had slowly returned since the departure of owner Rolf Elgeti, a light that star striker Mulhern feared had died away during the last season. When the players saw the manager enter the Conference room for the first meeting of the pre-season they saw no light in his eyes, they saw a fire burning. The man was glowing and looked an inch taller than when they had parted. “Lads, welcome back!” He announced with a crystal clear voice. “I hope you’ve enjoyed your summer break. What we achieved last season was nothing short of amazing! Our second half of the season was amazing and we finished with the best game of the season. Fylde didn’t know what hit them, but we sure made it clear to them! The players looked at each other, nodding and murmuring expectantly. Then Marcus Allbäck suddenly turned on the familiar sounds of Maroon 5 and started singing. “You got to move like Bielsa, you got to move like Bielsa, you got the mooooooooooves like Bielsa!” Half of the team stood up clapping and the other half covered their faces laughing but all of them were united in the feeling that they were in for one fun season. And that it would involve one hell of a lot of running. Since the departure of owner Rolf Elgeti manager, Marcus Allbäck has successfully moved away from the direct and risk minimizing football of “Sexi Brexi”. Last seasons success with a more passing focused style really strengthened his belief that this was the type of football Stockport were intended to play. With Mr Elgeti still nowhere to be found Marcus Allbäck spent the summer break travelling to meet some of football’s great minds and got stuck at Marcelo Bielsa’s cabin. Together they constructed a way of play that was as close to the opposite of the “Sexi Brexi” football as you could possibly get. The early long balls from behind were replaced with shorter passing, but still with a certain urgency to the build-up play. Even though the intent is to move the ball rather quickly up the field a lot of players are involved. With an IF cutting in from the left space opens up for overlaps from the left wing-back. On the right a winger keeps the width while the right wing-back moves in and offers support to the midfield duo. In defence the idea is to win the ball back as soon as possible and as close to the opposition’s goal as possible, to be able to immediately start to create chances again. This type of play requires players that are good at moving the ball offensively and running defensively. With Rolf Elgeti’s Sexi Brexi football requiring more robust players, Marcus Allbäck found himself missing certain important player types to be able to play this much more fluid football. Without any real money in the bank Marcus Allbäck had to look at Academy rejects from the big clubs in the local area. Players with enough talent to add quality to the team both immediately and in the future, and also living close enough to be willing to sign for the club. Everton, Liverpool, Manchester City and Manchester United rejects therefore became his prime targets. A speedy player who looks made for the IF role. A great acceleration paired with good Dribbling and First Touch makes this player a potential threat cutting in from the flank. A defensively solid centre-back with Heading 10, Marking 11 and Tackling 14. He’s also got a nice Acceleration and decent Passing and Technique, making him pretty well-rounded. However, he lacks some important mental skills to be a truly great defender straight away! A wing back with really strong physical abilities important for the position. He’s also got nice Crossing and Dribbling, making him a potential contender for the no1 spot out on the left. Another player with nice physicals, couple with mental attributes making him an interesting choice for central midfield. With good first touch, passing and tackling he is probably a man for the starting eleven straight away! A quick striker, especially when you consider his decent height. With Off The Ball 13 and Dribbling, First Touch and Finishing at 10+ he looks like more of a finisher than a forward involved in the build-up play. Being the son of Shaun Wright-Phillips he comes in with massive expectations. If he manages to live up to half of them he’ll be good enough for Stockport! With the combination of high numbers in Pace, Acceleration, Crossing and Dribbling he looks like a natural winger and will either be used as a wing-back, winger or IF. These additions give Marcus Allbäck options in every position and also adds player types that have previously been missing from the team, pacey players of higher technical quality, players needed to play and move like Bielsa! 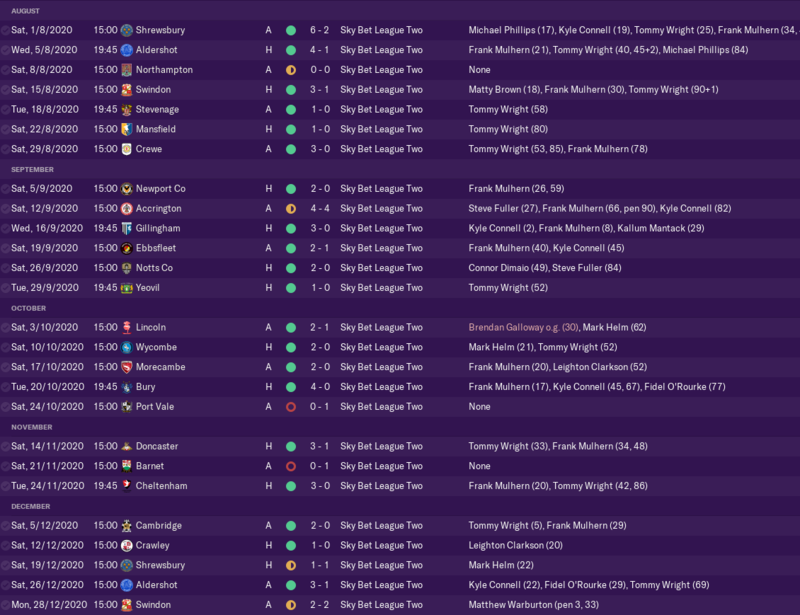 After achieving back-to-back promotions, rising from Vanarama North to League Two in only two seasons expectations where naturally quite low, even though whispers had been heard throughout the summer about a new secret tactics. The new tactics certainly worked wonders as the team looked unbeatable. It wasn’t until the 18th game week that the team had to taste the bitter drink of defeat. The entire first half of the season saw the team only lose twice, making this period perhaps even more astonishing than the previous season. The feeling that the team were fighting well over their weight class was soon replaced with admiration and awe as spectators flocked to Edgeley Park to see the team play, led by striking super duo Frank Mulhern and Tommy Wright. Newcomer Mark Helm looked above his age as he ruled the midfield against players twice his age! Marcus Allbäck was simply overjoyed as the team ended the season top of the league with 22 (twenty-two!) points ahead of Northampton in 4th place outside of the promotion spots. Surely nothing can stand in the way of Stockport and Marcus Allbäck as they are turning their League Two oppositions inside out and upside down?! In the next episode we’ll find out if (when?) 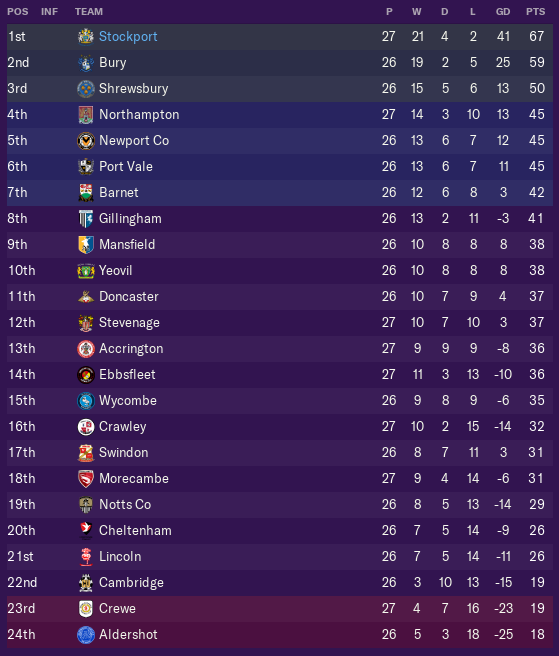 the team reaches promotion to League One! 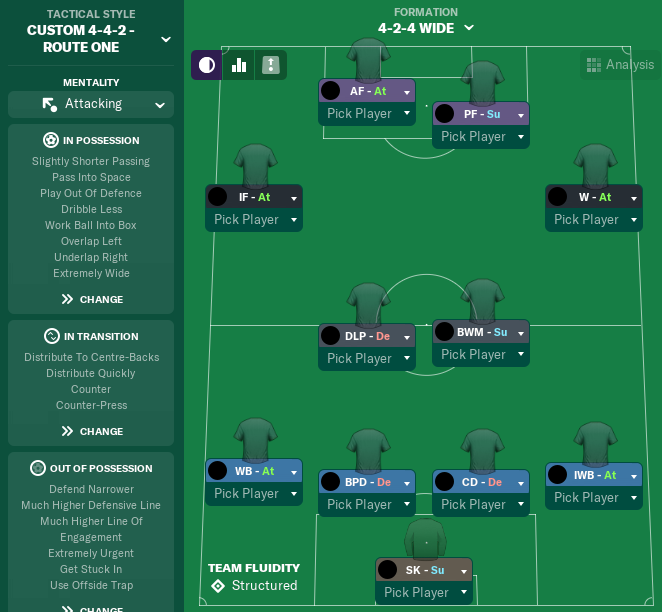 This entry was posted in Achievement Hunter Challenge | @MikaelinhoFM, FM19 Stories, Football Manager 2019 and tagged achievement hunter challenge, england, fm stories, fm19, football manager, league two, sexi brexi, stockport. Bookmark the permalink.